Received June 30, 2018; Revised September 11, 2018; Accepted September 11, 2018. Solanum berthaultii is one of the wild diploid Solanum species, which is an excellent resource in potato breeding owing to its resistance to several important pathogens. On the other hand, sexual hybridization between S. berthaultii and S. tuberosum (potato) is limited because of their sexual incompatibility. Therefore, cell fusion can be used to introgress various novel traits from this wild species into the cultivated potatoes. After cell fusion, it is crucial to identify fusion products with the aid of molecular markers. 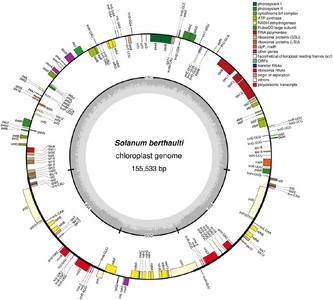 In this study, the chloroplast genome sequence of S. berthaultii obtained by next-generation sequencing technology was described and compared with those of five other Solanum species to develop S. berthaultii specific markers. A total sequence length of the chloroplast genome is 155,533 bp. The structural organization of the chloroplast genome is similar to those of the five other Solanum species. Phylogenic analysis with 25 other Solanaceae species revealed that S. berthaultii is most closely located with S. tuberosum. Additional comparison of the chloroplast genome sequence with those of the five Solanum species revealed 25 SNPs specific to S. berthaultii. 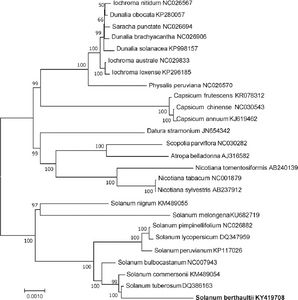 Based on these SNPs, six PCR-based markers for differentiating S. berthaultii from other Solanum species were developed. These markers will facilitate the selection of fusion products and accelerate potato breeding using S. berthaultii. Potato (Solanum tuberosum L.) is one of the most important crops in the world. Its production has been jeopardized seriously by diverse pathogens, particularly the oomycete pathogen, Phytophthora infestans, the causal agent of late blight (Rauscher et al. 2006). Therefore, potato breeding has focused on achieving high level resistance to late blight. Moreover, several resistant genes have been introgressed to improve the resistance to late blight from wild Solanum species into cultivated potatoes in potato breeding. S. berthaultii originating from Bolivia, South America is a wild diploid species and a relative of potato (Pavek and Corsini 2001; Spooner and Castillo 1997). The species has been known as one of the important resources for resistance to several important pathogens such as Phytophthora infestans, potato virus Y etc. in potato breeding (Ewing et al. 2000; Nouri-Ellouz et al. 2016; Park et al. 2009; Rauscher et al. 2010; Tan et al. 2010). On the other hand, sexual incompatibility caused by the different ploidy levels of the genome and endosperm balance number (EBN) between this wild species and potato have restricted the utilization of this wild species for improvements during classical breeding processes (Cho et al. 1997; Oritz and Ehlenfeldt 1992). To overcome this sexual barrier for interspecific gene transfer, therefore, protoplast fusion has been attempted with the two different species for crop improvement (Bidani et al. 2007; Nouri-Ellouz et al. 2016). In potato breeding, this technique has also been applied and succeeded in producing interspecific somatic hybrids such as S. tuberosum (+) S. chaconese (Chen et al. 2013), S. tuberosum (+) S. brevidens (Barsby et al. 1984), S. tuberosum (+) S. nigrum (Binding et al. 1982), S. tuberosum (+) S. phureja (Putie et al. 1986) and S. tuberosum (+) S. commersonii (Kim-Lee et al. 2005). When somatic hybridization is performed successfully, molecular markers can be used for the identification and verification of the somatic hybrids to confirm the hybridity of both nuclear and organelle DNA (Cho and Park 2016; Cho et al. 2016). This process is essential due to the fact that a large amount of nuclear and organelle DNA can be transferred between two sexually incompatible species (Guo et al. 2004). The chloroplast, a photosynthetic intracellular organelle has a circular double-stranded DNA molecule on its own genome. Most chloroplast genomes contain 110-130 genes encoding up to 80 unique proteins, approximately 30 tRNAs and 4 rRNAs. The angiosperm chloroplast is usually 115 ~ 165 kb in size and has a quadripartite organization comprised of two 12-75 kb inverted repeats (IR) separating the 80 ~ 90 kb large single copy (LSC) and 16 ~ 27 kb small single copy (SSC) regions (Yurina and Odintosova 1998). As shown in Table 1, several complete chloroplast genome sequences of Solanum species including S. tuberosum (KM489056 and NC008096), S. commersonii (KM489055), S. bulbocastanum (NC007943), and S. nigrum (KM489054) have previously been reported (Cho and Park 2016; Cho et al. 2016; Chung et al. 2006; Daniell et al. 2006). Their chloroplast genomes are highly conserved in size, structure and gene organization including the presence of two copies of IRs separated by LSC and SSC regions as previously known (Palmer 1991; Raubeson and Jansen 2005; Saski et al. 2005; Sugiura et al. 1998). Nevertheless, diversification of chloroplast genome sequences derived from the comparison of complete chloroplast genome sequences among plant species provides sufficient information (Cho et al. 2015). In the chloroplast genomes of many plants, a number of mutations such as single nucleotide polymorphism (SNPs), and insertions/deletions (InDels) and structural changes such as inversions, and rearrangements of gene order have been reported (Calsa Junior et al. 2004; Jheng et al. 2012; Kim et al. 2005; Saski et al. 2005). Previously, the chloroplast genome sequence of S. berthaultii was completed using next-generation sequencing technology and shortly announced (Park 2017). In this study, we described the result of the sequence in detail, compared it with those of other Solanaceae species, and developed specific markers for S. berthaultii. Plant materials of 22 genotypes of Solanum species such as S. tuberosum (PT56), S. berthaultii (PI310981; SB1-1, -2, -4 and -6), S. acaule (PI310970; SA-2), S. pinnatisectum (PI190115; SP-12), S. hjertingii (PI186559; SH1-15), S. mochiquense (PI338616; SM1-6), S. cardiophyllum (PI341233; SC1-2), S. verrucosum (PI160228; SV1-4), S. kurtzianum (PI498422; SK-5), S. stoloniferum (PI160224; SS-1), S. hougassi (PI161174; SH2-10), S. microdontum (PI310979; SM2-3), S. commersonii (PI558050; SC2-7), S. chacoense (PI201846; SC3-6), S. demissum (PI218047; SD-9), S. brevicaule (PI205394; SB2-7), S. vernei (PI230468; SV2-4), S. jamesii (PI578236; SJ-1) and S. tuberosum subsp. andigenum (PI566805; ST2-1) provided by the Highland Agriculture Research Institute, South Korea were used to compare molecular markers. They were cultivated in a greenhouse and cultured in vitro. For DNA isolation, fresh leaves collected from the greenhouse or in vitro plants were directly used or freeze-dried, ground and stored at -80°C when they were needed. Approximately 100 mg of fresh leaves were applied for the extraction of the total genomic DNA using a Genomic DNA Extraction kit for plants (RBC, New Taipei City, Taiwan). Sequencing was conducted using the Illumina Hiseq2000 (Illumina, SanDiego, CA, USA) platform at Macrogen (Macrogen, Seoul, South Korea) with the total genomic DNA of S. berthaultii (SB1-1). The chloroplast genome sequence was obtained by de novo assembly via the Phyzen bioinformatics pipeline (http://phyzen.com). A CLC assembler (ver. 4.06 beta, CLC Inc, Rarhus, Denmark) was used for de novo assembly. From the overall reads, reads with raw scores of 20 or less were discarded using the CLC-quality trim tool and the parameters of a minimum (300 ~ 1,000 bp) autonomously controlled overlap size were applied. From the total contigs, the principal contigs representing the chloroplast genome were retrieved by Nucmer (Kurtz et al. 2004) using the chloroplast genome sequence of S. tuberosum (KM489056) as the reference sequence (Cho et al. 2016). The results from BLASTZ analysis with the reference sequence arranged the representative chloroplast contigs in order (Schwartz et al. 2003) and they were connected to a single draft sequence by joining the overlapping terminal sequences followed by manual editing through a comparison with the chloroplast genome sequence of S. tuberosum (KM489056) reported by Cho et al. (2016). Gene annotation was conducted using DOGMA (Wyman et al. 2004) and the circular map of the S. berthaultii chloroplast genome was generated using the software OrganellarGenomeDRAW (http://ogdraw.mpimp-golm.mpg.de) (Lohse et al. 2013). The chloroplast genome sequence of S. berthaultii identified in this study was compared with those of 25 Solanaceae species including eight Solanum species, S. tuberosum (DQ386163), S. commersonii (KM489054), S. bulbocastanum (NC007943), S. lycopersicum (DQ347959), S. pimpinellifolium (NC026882), S. peruvianum (KP117026), S. nigrum (KM 489055), and S. melongena (KU682719) obtained from the National Center for Biotechnology Information (NCBI). Sequence comparison and phylogenetic analysis were conducted using the chloroplast coding sequences of eight species by MEGA 6.0 (Tamura et al. 2013) and by a maximum likelihood and a maximum parsimony methods under PAUP* v4.0b10 (Swofford 2001), respectively. A total of 1,000 bootstap replicates and a 50% cutoff value for the bootstrap consensus tree were applied for the analysis. Multiple alignment was also performed using the complete chloroplast genome sequences of six species by ClustalW2 in EMBL (https://www.ebi.ac.uk/Tools/msa/clustalw2). The S. berthaultii specific SNPs were identified with the results of multiple alignment with five Solanum species: S. berthaultii (KY419708), S. tuberosum (KM489056 and NC 008096), S. commersonii (KM489054), S. bulbocastanum (DQ347958), and S. nigrum (KM489055). After checking whether or not the proper restriction enzymes, which could digest only a SNP region on the sequence of S. berthaultii or on the sequence of other four Solanum species, existed using dCAPS Finder 2.0 (http://helix.wustl.edu/dcaps/dcaps.html), the primers covering each SNP region were designed. PCR was routinely performed with the 22 genotypes (PT56, SB1-1, SB1-2, SB1-4, SB1-6, SA-2, SP-12, SH1-15, SM1-6, SC1-2, SV1-4, SK-5, SS-1, SH2-10, SM2-3, SC2-7, SC3-6, SD-9, SB2-7, SV2-4, SJ-1, and ST2-1) as described by Cho and Park (2016). The DNA fragments in the PCR products were separated on 1% agarose gel and detected using the nucleic acid staining solution RedSafe (Intron Biotechnology, Seongnam, South Korea). When all 22 genotypes were amplified with certain primers, the selected restriction enzymes were applied to the PCR products. The digested fragments were separated by electrophoresis on 1% agarose gel and visualized under UV lights. The complete chloroplast genome sequencing of S. berthaultii was performed using NGS (next generation sequencing) technology. A library produced by the Illumina PE standard protocol generated 2,506,011,690 bp sequences in total and their average read length was 348 bp. Three representative contigs were identified using the de novo assembly of paired end sequences of the entire genome. They covered the entire chloroplast genome sequence of S. tuberosum (KM489056) reported by Cho et al. (2016) and arranged in order based on the results of BLASTZ analysis (Schwartz et al. 2003) (Fig. 1). The putative assembly errors curated by mapping 1,699.85x raw reads onto the final assembly, and PCR products of several regions including border sequences of a pair of inverted repeats (IRs), a small single copy region (SSC) and a large single copy region (LSC) validated by BigDye Terminator Cycle Sequencing with ABI3730 automated capillary sequencer finalized the completion of the chloroplast genome sequence. As a part of the results has shortly been announced (Park 2017), the size of the complete chloroplast genome sequence of S. berthaultii (GenBank accession no. KY419708) is 155,533 bp. It has the typical quadripartite structure including 25,593 bp IRs separated by SSC of 18,372 bp and LSC of 85,975 bp with a circular double stranded DNA molecule as usual in most plant plastids. The total length is slightly longer than those of other Solanum species (Table 1). The chloroplast genome of S. berthaultii contains 137 unique genes and 11 of them are duplicated in the IRs (Fig. 2). Fourty-eight tRNAs and eight rRNAs exist and nine and four of them are duplicated and inversely oriented in the IRs (Fig. 2 and Table 1). 59.2% coding region of the genome was identified and an average size of the coding sequences is 583 bp. It consists of 51.6% protein coding genes with an average size of 508 bp and 7.7% RNA genes with an average size of 214 bp. The GC content of the genome is 37.88% (Table 1). As reported by Cho et al. (2016) and Cho and Park (2016), the total length, the GC content, and the total number of predicted genes, tRNA and rRNA of the S. berthaultii chloroplast genome are highly conserved with those of other Solanum species. As shown in Figure 3, the phylogenetic relationship was analyzed using chloroplast coding sequence of S. berthaultii and those of the 25 Solanaceae species. The maximum parsimony and maximum likelihood analyses produced the same topology and most nodes of the phylogenetic tree were strongly supported by the high bootstrap values. The results showed that S. berthaultii belonged to the same clade in Solanum species as expected and S. berthaultii formed the sister of S. tuberosum. Interestingly, S. berthaultii was the closest species to S. tuberosum even though it was S. commersonii (Cho et al. 2016). The complete sequence of the S. berthaultii chloroplast genome was compared with those of the five other Solanum species including two different genotypes of S. tuberosum to develop molecular markers for the selection of S. berthaultii cytoplasm as a reasonable number of InDels or SNPs was previously detected by the complete alignment of the chloroplast genome sequences including both the coding and non-coding regions of the Solanum species (Chung et al., 2006; Cho and Park, 2016). A result of multiple alignment with six species generated by ClustalW2 in EMBL (https://www.ebi.ac.uk/Tools/msa/clustalw2) showed that overall 39 and 1,788 regions for InDels and SNPs existed among the six Solanum species, respectively. The multiple alignment of the chloroplast genome sequences of six different Solanum species revealed a lot of InDels and SNPs among the species. On the other hand, the InDels and SNPs were caused mostly by the sequences of S. nigrum or S. bulbocastanum (detail data not shown). This result was supported by the fact that those two species were farther phylogenetically from S. berthaultii than S. commersonii and S. tuberosum as shown in the result of phylogenetic tree (Fig. 3). Therefore, the criteria to search for the InDels or SNPs in which the sequences should be specific to S. berthaultii, but mostly conserved in the five other Solanum species. Only two of the 39 InDels detected were specific to S. berthaultii, but PCR-based molecular markers could not be developed using InDel specific primers. One base pair in the sequence of S. berthaultii was different from those of S. tuberosum and S. commersonii, 19 base pairs from that of S. bulbocastanum and six base pairs from that of S. nigrum on the first InDel region. Two base pairs in the sequence of S. berthaultii were different from those of S. tuberosum and S. commersonii, five base pairs from that of S. bulbocastanum and 438 base pairs from that of S. nigrum on the second InDel region. Therefore, this study focused on the SNPs identified among six species to develop PCR-based markers. A total of 25 of the 1,788 SNPs detected were specific to S. berthaultii. 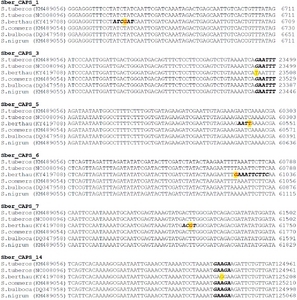 Five SNPs including four consecutive base pairs existed on the inverted repeat region. The regions on which the SNPs existed were distributed almost equally in both coding regions and non- coding regions throughout the entire chloroplast genome sequence although the number of InDels in the non-coding regions was reported to be detected much more than that in the coding regions of the chloroplast genome of Solanum species (Cho and Park 2016; Chung et al. 2006). The application of PCR to SNPs can be used effectively to develop molecular markers after the PCR products are digested with the appropriate restriction enzymes on the site of the SNPs revealing polymorphisms, which is called the CAPS (cleaved amplified polymorphism sequence) marker (Konieczny and Ausubel, 1993). The CAPS is applied broadly to develop polymorphic markers that can be used to compare different genotypes on Solanum species (Park et al. 2005; Smilde et al. 2005; Uribe et al. 2014) and other plant species (Komori and Nitta 2005; Uncu et al. 2015; Wang et al. 2017). Therefore, 11 primers pairs covering each SNPs site onto which the proper restriction enzymes had been identified were designed. The restriction enzymes could digest only S. berthaultii or other Solanum species except S. berthaultii. 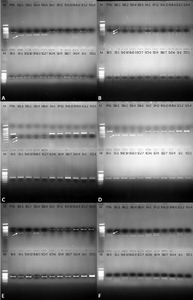 The primers were used for PCR with four different lines of S. berthaultii (SB1-1, -2, -3, and -4), S. tuberosum (PT56), S. acaule (SA-2), S. pinnatisectum (SP-12), S. hjertingii (SH1-15), S. mochiquense (SM1-6), S. cardiophyllum (SC1-2), S. verrucosum (SV1-4), S. kurtzianum (SK-5), S. tuberosum line, S. stoloniferum (SS-1), S. hougassi (SH2-10), S. microdontum (SM2-3), S. commersonii (SC2-7), S. chacoense (SC3-6), S. demissum (SD-9), S. brevicaule (SB2-7), S. vernei (SV2-4), S. jamesii (SJ-1), and S. tuberosum subsp. andigenum (ST2-1) and the restriction enzymes for each SNPs were applied to the PCR products. Finally, six CAPS markers were identified (Table 2 and Fig. 5). Four primer combinations and restriction enzymes that produced distinct bands in the four S. berthaultii lines, but not in the other Solanum species including S. tuberosum (PT56) were selected (Table 2, Fig. 5A, 5C, 5D and 5E) and two others were vice versa (Table 2, Fig. 5B and 5F). Size (bp) indicates the expected sizes of PCR fragments determined based on the S. berthaultii sequence. RE indicates restriction enzymes generating S. berthaultii specific markers by cutting the S. berthaultii specific SNPs. Characterization of the chlorotype using the molecular markers is important for not only potato breeding, but also evolutionary studies in Solanum species (Bohs and Olmstead 1997; Hosaka and Sanetomo 2012). In previous studies, a random distribution of the chloroplast genome from a certain genotype during in vitro plant regeneration and somatic fusion was commonly observed in plant species including Solanum species, even though a high frequency of recombination occurred in the mitochondrial genome (Chen et al. 2013; Cho et al. 2016; Lössl et al. 2000; Mohapatra et al. 1998; Smyda-Dajmund et al. 2016; Xiang et al. 2004). Overall, the results suggest that the SNP-derived CAPS markers developed in this study can be used to discriminate S. berthaultii reliably from other Solanum species, to select the proper chlorotype from the fusion products between S. berthaultii and Solanum species and to facilitate potato breeding using S. berthaultii. This study was supported by Korea Institute of Planning and Evaluation for Technology in Food, Agriculture, Forestry and Fisheries (IPET) through Golden Seed Project funded by Ministry of Agriculture, Food and Rural Affairs (MAFRA), Ministry of Oceans and Fisheries (MOF), Rural Development Administration (RDA) and Korea Forest Service (KFS), South Korea (Project No. 213009-05-2-WT411). Barsby TL, Shepard JF, Kemble RJ, and Wong R. (1984) Somatic hybridization in the genus SolanumS. tuberosum and S. brevidens. Plant Cell Rep 3, 165-167. Bidani A, Nouri-Ellouz O, Lakhoua L, Shihachakr D, Cheniclet C, Mahjoub A, Drira N, and Gargouri-Bouzid R. (2007) Interspecific potato somatic hybrids between Solanum berthaultii and Solanum tubersoum L. showed recombinant plastome and improved tolerance to salinity. Plant Cell Tiss Organ Cult 91, 179-189. Binding H, Jain SM, Finger J, Mordhorst G, Nehls R, and Gressel J. (1982) Somatic hybridization of an atrazine resistant biotype of Solanum nigrum with Solanum tuberosum. Theor Appl Genet 63, 273-277. Bohs L, and Olmstead RG. (1997) Phylogenetic relationships in Solanum(Solanaceae) based on ndhF sequences. Syst Bot 22, 5-17. Calsa Junior T, Carraro DM, Benatti MR, Barbosa AC, Kitajima JP, and Carrer H. (2004) Structural features and transcript-editing analysis of sugarcane (Saccharumofficinarum L.) chloroplast genome. Curr Genet 46, 366-373. Chen L, Guo X, Xie C, He L, Cai X, Tian L, Song B, and Liu J. (2013) Nuclear and cytoplasmic genome components of Solanum tuberosum+S. chacoense somatic hybrids and three SSR alleles related to bacterial wilt resistance. Theor Appl Genet 126, 1861-1872. Cho KS, Cheon KS, Hong SY, Cho JH, Im JS, Mekapogu M, Yu YS, and Park TH. (2016) Complete chloroplast genome sequences of Solanum commersonii and its application to chloroplast genotype in somatic hybrids with Solanum tuberosum. Plant Cell Rep 35, 2113-2123. Cho HM, Kim-Lee HY, Om YH, and Kim JK. (1997) Influence of endosperm balance number (EBN) in interploidal and interspecific crosses between Solanum tuberosum dihaploids and wild species. Korean J Breed 29, 154-161. Cho KS, and Park TH. (2016) Complete chloroplast genome sequence of Solanum nigrum and Development of markers for the discrimination of S. nigrum. Hort Environ Biotechnol 57, 69-78. Cho K-S, Yun B-K, Yoon Y-H, Hong S-Y, Mekapogu M, Kim K-H, and Yang T-J. (2015) Complete chloroplast genome sequence of tartary Buckwheat (Fagopyrum tataricum) and comparative analysis with common Buckwheat (F. esculentum). PloS One 10, e0125332. Chung HJ, Jung JD, Park HW, Kim JH, Cha HW, Min SR, Jeong WJ, and Liu JR. (2006) The complete chloroplast genome sequences of Solanum tuberosum and comparative analysis with Solanaceae species identified the presence of a 241-bp in cultivated potato chloroplast DNA sequence. Plant Cell Rep 25, 1369-1379. Daniell H, Lee S-B, Grevich J, Saski C, Quesada-Vargas T, Guda C, Tomkins J, and Jansen PK. (2006) Complete chloroplast genome sequences of Solanum bulbocastanumSolanum lycopersicum and comparative analyses with other Solanaceae genomes. Theor Appl Genet 112, 1503-1518. Ewing EE, Simko I, Samrt CD, Bonierbale MW, Mizubuti ESG, May GD, and Fry WE. (2000) Genetic mapping from field tests of qualitative and quantitative resistance to Phytophthora infestans in a population derived from Solanum tuberosum and Solanum berthaultii. Mol Breeding 6, 25-36. Guo WW, Cai XD, and Grosser JW. (2004) Somatic cell cybrids and hybrids in plant improvement. Molecular biology and biotechnology of plant organelles, Daniell H, and Chase C (eds.) , pp.635-659. Springer, Dordrecht, The Netherlands. Hosaka K, and Sanetomo R. (2012) Development of a rapid identification method for potato cytoplasm and its use for evaluating Japanese collections. Theor Appl Genet 125, 1237-1251. Jheng C-F, Chen T-C, Lin J-Y, Chen T-C, Wu W-L, and Chang C-C. (2012) The comparative chloroplast genomic analysis of photosynthetic orchids and developing DNA markers to distinguish Phalaenopsis orchids. Plant Sci 190, 62-73. Kim KJ, Choi KS, and Jansen RK. (2005) Two chloroplast DNA inversion originated simultaneously during the early evolution of the sunflower family (Asteraceae). Mol Biol Evol 22, 1783-1792. Kim-Lee H, Moon JS, Hong YJ, Kim MS, and Cho HM. (2005) Bacterial wilt resistance in the progenies of the fusion hybrids between haploid of potato and Solanum commersonii. Amer J Potato Res 82, 129-137. Komori T, and Nitta N. (2005) Utilization of the CAPS/dCAPS method to convert rice SNPs into PCR-based markers. Breed Sci 55, 93-98. Konieczny A, and Ausubel FM. (1993) A procedure for mapping Arabidopsis mutations using co-dominant ecotype-specific PCR-based markers. Plant J 4, 403-410. Kurtz S, Phillippy A, Delcher AL, Smoot M, Shumway M, Antonescu C, and Salzberg SL. (2004) Versatile and open software for comparing large genomes. Genome Biol 5, R12. Lohse M, Drechsel O, Kahlau S, and Bock R. (2013) Organellar GenomeDRAW –a suite of tools for generating physical maps of plastid and mitochondrial genomes and visualizing expression data sets. Nucleic Acids Res 41, W575-W581. Lössl A, Götz A, Braun A, and Wenzel G. (2000) Molecular markers for cytoplasm in potato:male sterility and contribution of different plastid-mitochondrial configurations to starch production. Euphytica 116, 221-230. Mohapatra T, Kirti PB, Dinesh Kumar V, Prakash S, and Chopra VL. (1998) Random chloroplast segregation and mitochondrial genome recombination in somatic hybrid plants of Diplotaxis catholica+Brassica juncea. Plant Cell Rep 17, 814-818. Nouri-Ellouz O, Triki MA, Jbir-Koubaa R, Louhichi A, Charfeddine S, Drira N, and Gargouri-Bouzid R. (2016) Somatic hybrids between potato and S. berthaultii show partial resistance to soil-borne fungi and potato virus Y. J Phythpathol 164, 485-496. Ortiz R, and Ehlenfeldt MK. (1992) The importance of endorsperm balance number in potato breeding and the evolution of tuber-bearing Solanum species. Euphytica 60, 105-113. Palmer JD. (1991) Plastid chromosomes:structure and evolution. The molecular biology of plastids, Bogorad L, and Vasil K (eds.) , pp.5-53. Academic Press, San Diego, USA. Park T-H. (2017) The complete chloroplast genome of Solanum berthaultii, one of the potato wild relative species. Mitochondr DNA Part B 2, 88-89. Park T-H, Foster S, Brigneti G, and Jones JDG. (2009) Two distinct potato late blight resistance genes from Solanum berthaultii are located on chromosome 10. Euphytica 165, 269-278. Park T-H, Gros J, Sikkema A, Vleeshouwers VGAA, Muskens M, Allefs S, Jacobsen E, Visser RGF, and van der Vossen EAG. (2005) The late blight resistance locus Rpi-blb3 from Solanumbulbocastanum belongs to a major late blight R gene cluster on chromosome 4 of potato. Mol Plant-Microb Interact 18, 722-729. Pavek JJ, and Corsini DL. (2001) Utilization of potato genetic resources in variety development. Amer J Potato Res 78, 433-441. Puite KJ, Roest S, and Pijnacker LP. (1986) Somatic hybrid potato plants after electrofusion of diploid Solanum tuberosum and Solanum phureja. Plant Cell Rep 5, 262-265. Raubeson LA, and Jansen RK. (2005) Chloroplast genomes of plants. Diversity and evolution of plants:genotypic and phenotypic variation in higher plants, Henry H (ed.) , pp.45-68. CABI Publishing, Wallingford, UK. Rauscher GM, Samrt CD, Simko I, Bonierbale M, Mayton H, Greenland A, and Fry WE. (2006) Characterization and mapping of Rpi-ber a novel potato late blight resistance gene from Solanum berthaultii. Theor Appl Genet 112, 674-687. Rauscher G, Simko I, Mayton H, Bonierbale M, Smart CD, Grünwald NJ, Greenland A, and Fry WE. (2010) Quantitative resistance to late blight from Solanum berthaultii cosegregates with Rpi-ber:insights in stability through isolates and environment. Theor Appl Genet 121, 1553-1567. Saski C, Lee SB, Daniell H, Wood TC, Tomkins J, Kim HG, and Jansen RK. (2005) Complete chloroplast genome sequence of Glycine max and comparative analyses with other legume genomes. Plant Mol Biol 59, 309-322. Schwartz S, Kent WJ, Smit A, Zhang Z, Baertsch R, Hardison RC, Haussler D, and Miller W. (2003) Human-mouse alignments with BLASTZ. Genome Res 13, 103-107. Smilde WD, Brigneti G, Jagger L, Perkins S, and Jones JDG. (2005) Solanum mochiquense chromosome IX carries a novel late blight resistance gene Rpi-moc1. Theor Appl Genet 110, 252-258. Spooner DM, and Castillo R. (1997) Reexamination of series relationships of South American wild potatoes (Solanaceae Solanum sect. Petato) :evidence from chloroplast DNA restriction site variation. Am J Botany 84, 671-685. Sugiura M, Hirose T, and Sugita M. (1998) Evolution and mechanism of translation in chloroplast. Annu Rev Genet 32, 437-459. Swofford DL. (2001). Phylogenetic analysis using parsimony (*and other methods . Sinauer Associates, Sunderland. Symda-Dajmund P, Śliwka J, Wasilewicz-Flis I, Jakuczun H, and Zimnoch-Guzowska E. (2016) Genetic composition of interspecific potato somatic hybrids and autofused 4x plants evaluated by DArT and cytoplasmic DNA markers. Plant Cell Rep 35, 1345-1358. Tamura K, Stecher G, Peterson D, Filipski A, and Kumar S. (2013) MEGA6:molecular evolutionary genetic analysis version 6.0. Mol Biol Evol 30, 2725-2729. Tan MYA, Hutten RCB, Visser RGF, and van Eck HJ. (2010) The effect of pyramiding of Phytophthora infestans resistance genes Rpi-mcd1 and Rpi-ber in potato. Theor Appl Genet 121, 117-125. Uncu AT, Celik I, Devran Z, Ozkaynak E, Frary A, Frary A, and Doganlar S. (2015) Development of a SNP-based CAPS assay for the Me1 gene conferring resistance to root knot nematode in pepper. Euphytica 206, 393-399. Uribe P, Jansky S, and Halterman D. (2014) Two CAPS markers predict Verticillium wilt resistance in wild Solanum species. Mol Breeding 33, 465-476. Wang Y, Liu W, Xu L, Wang Y, Chen Y, Luo X, Tang M, and Liu L. (2017) Development of SNP markers based on transcriptome sequences and their application in germplasm identification in radish (Raphanus sativus L.). Mol Breeding 37, 26. Wyman SK, Jansen RK, and Boore JL. (2004) Antomatic annotation of organellar genomes with DOGMA. Bioinformatics 20, 3252-3255. Xiang F, Xia G, Zhi D, Wang J, Nie H, and Chen H. (2004) Regeneration of somatic hybrids in relation to the nuclear and cytoplasmic genomes of wheat and Setaria italica. Genome 47, 680-688. Yurina NP, and Odintsova MS. (1998) Comparative structural organization of plant chloroplast and mitochondrial genomes. Russ J Genet 34, 5-22. Zeka D, Sedlak P, Sedlakova V, Vasek J, Domkarova J, and Vejl P. (2014) cpDNA SSR polymorphism in secondary germplasm of potato maintained in Czech gene bank. Pak J Agr Sci 51, 743-748.